Although cookies are not normally my favorite dessert, I do make a few exceptions. 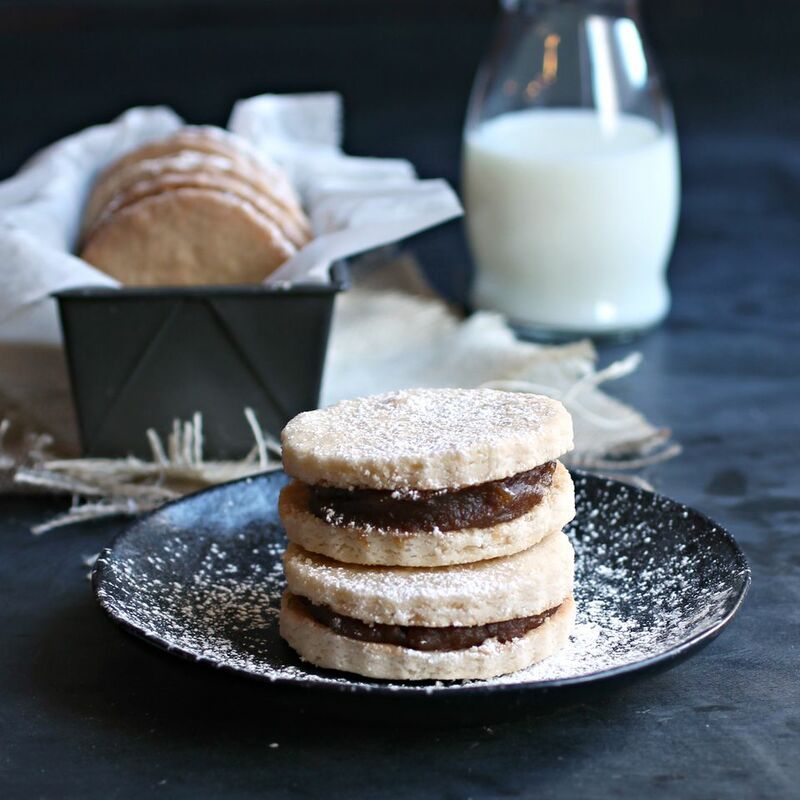 I have a long love of shortbread and fondness for linzer and other sandwich type cookies. There's something about that buttery dough on the outside, a sweet, fruity filling on the inside and the whole thing dusted with powdered sugar that comes together in a perfect bite. Sandwich cookies from the supermarket never quite seem to absorb the flavor of the filling, probably too many preservatives keep them crisp. But homemade, or bakery made, cookies always always get a bit softer with time, as the fruity filling seeps into the cookies. Oh, it's so good! One of my favorite fillings is a classic Middle Eastern flavor of my childhood, dates. They're so naturally sweet that only a bit of honey and salt is needed to make the most delicious cookie filling. Add the pitted dates to a bowl and fill with the cup of hot water. Allow to soak for at least 30 minutes. When ready, add the dates and about 1/4 cup of the water to a food processor along with the honey and salt. Puree until completely smooth. To make the cookies, sift together the flour, sugar and salt in a large bowl. Cut in the butter using a pastry cutter or fork. You can also do this in a stand mixer. Add the vanilla and buttermilk and stir until combined. Note that the batter will probably be too thick for a mixer and you will need to do this by hand. Turn the dough out onto a floured board and form into a disk. Wrap in plastic and refrigerate for at least 30 minutes. Pre-heat the oven to 350 degrees. Roll out the cookie dough, on a well floured surface, to about 1/4" thick. Use a cookie cutter (mine was about 3") to cut out rounds and place them on a baking sheet lined with parchment paper. Bake for 12 - 14 minutes and allow to cool for at least 15 minutes before moving. The cookies will be very soft when you take them out of the oven but will harden after cooling. Place a tablespoon of honey date filling in the center of one cookie and top with a second cookie to spread the filling. A 3" cutter will yield about 16 cookies which will be 8 sandwiched cookies.